I recently came across the discussion about the fate of the homework tag. Now, before I start, let me make it clear that I agree that the homework tag should be removed. I'm a regular user on the main site and have been for the last two year. Despite this, I had no idea that this discussion was taking place. To be honest, I found it a little scary that there were a total of 211 votes cast, and from that vote, it looks like the homework tag could be removed. The number 211 seemed really very small to me. On the main site, there are over 100,000 registered users. Now, of course, many of these have only used the site once or twice. There are 2019 editors on the main site. There are users that are able to edit people's posts. It seems that all of these users have at least 1,000 reputation; these are experienced users. It follows that only 210 out of 2019, i.e. only 10% of the editor population voted on a featured meta discussion. Out of these 210 votes, 156 voted to remove the homework tag. That means that 156 out of 2019, i.e. 7.7% of the editor population supported the removal of the tag. It is clear that discussions with a voter turnout of 10%, and a support of 7.7% have no popular mandate whatsoever. If a politician were elected on such figures there would be serious questions asked. It can be argued that many of the users on the main site have no interest in what happens on meta. I would say that the reality is that many of the users on the main site have no idea that meta exists, nor what it does. It can be argued that those that don't vote shouldn't complain about the results of an election. I would say that the majority of those that don't vote, don't know that there is anything to vote about. All modern democracies around the World strive to increase voter turnout and voter engagement. This site owes it to itself, and to the users of the main site, to increase involvement. What can we do to improve involvement? I have two ideas. I would like to hear yours. We could incorporate the meta site in to the main site. For example, just as we have a "questions" tab, we could have, e.g. a "policy" tab. When Wikipedia want to raise money, they have started including drop-down banner headers. We could include drop-down banners that say something like "Want a say in the way your site's run? Well get yourself over to meta." Anything that can be done to increase involvement in the decision making process has to be a good thing. What ideas do you have to increase involvement in the decision making process? There are 2019 editors on the main site. Different methods of counting yield different numbers. During the month of July (which is conveniently about to end) only 239 users edited 5 posts or more. And many of users on this list are under 1000 reputation. The site has just turned four years old, and the level of activity of users widely fluctuates over such a period of time. Remarkably, on the list of all-time editors two out of top five users have not been seen for 1-2 years. Moderators used to be able to put up a banner notice on the main site, but SE took that away early last year. So they'd have to be convinced to reconsider. I do not think that banners would yield dramatically better results than Community Bulletin. During moderator elections, users get a personal inbox message telling them to vote, and very few do so, percentage-wise. This is a non-starter. The concept of meta separation one of fundamental SE ideas. It's right there in the first paragraph of What's Meta? It is separated from the main Q&A to reduce noise there while providing a legitimate space for people to ask how and why this site works the way it does. For example, you were aware of meta for a long time, but voted the total of 7 times up to now. It seems that the lack of awareness isn't the only issue here; awareness does not directly translate into sustained interest and participation. I am not a fan of the meta. It's seductive in a way that is subtly but deeply dangerous. It's far easier to introspect and write about the process of, say .. blogging .. than it is to think up, research, and write about an interesting new topic on your blog. Meta-work becomes a reflex, a habit, an addiction, and ultimately a replacement for real productive work. It's something I think everyone should watch out for, whatever walk of life or career you happen to have. 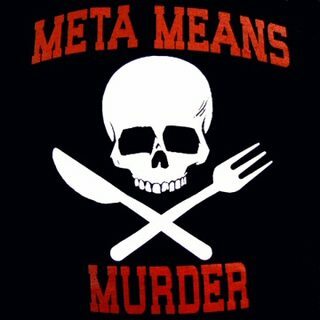 In fact, I've come up with a zingy little catch phrase to help people remind themselves, and their coworkers, how toxic this stuff can be -- meta is murder. If a politician were elected on such figures there would be serious questions asked. Moderators are elected on such figures (in the latest elections, 86 votes sufficed), with no questions asked. Also, a better comparison for tag decisions would be the meetings of a local Planning and Zoning Committee. Compare the number of city residents vs the number of people who actually show up to such meetings (held open to the public). And so goes another boring meta post... here's a parallel to liven it up a bit. There's no point in acting surprised about it. All the planning charts and demolition orders have been on display at your local planning department in Alpha Centauri for fifty of your Earth years, so you've had plenty of time to lodge any formal complaint and it's far too late to start making a fuss about it now. . . . What do you mean you've never been to Alpha Centauri? Oh, for heaven's sake, mankind, it's only four light years away, you know. I'm sorry, but if you can't be bothered to take an interest in local affairs, that's your own lookout. Energize the demolition beams. Is a “catalog of advanced integrals” appropriate for this meta?